Updated Wednesday May 9, 2018 by CHANDLER AYF. 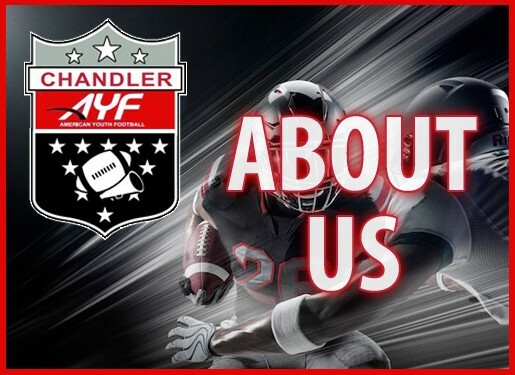 Chandler AYF is unique and does not focus on any other organization, instead we strive to partner with them to give a broader opportunity and benefit to the community. We do pride ourselves in the community efforts that promote academic achievement and excellence. Likewise the competition on the field has a national reputation of being one of the best in the country. These can be directly correlated to the systems and processes that were put into place by our current AYF leadership. The City of Chandler, Gilbert, and the East Valley has multiple Youth Football programs available to the community and we will continue to partner with them all as well as the community. If they are keeping kids off the street , allowing kids to get exercise, and teaching the great game of football and cheerleading, it's all good! We value the Coach/Player relationship and do not actively recruit organizations. The parents decide and we support that 100%. At this time, Chandler AYF is looking to field teams as we are still accepting coach/volunteer applications, if interested, please contact us. We teach our participants to COMPETE! In the CLASSROOM, On the GRIDIRON, and On the MAT! For the Fall 2017 Season - Our Focus is Football, Cheerleading, Academics, Giving Back, and Fun! For those new to Chandler AYF, we welcome new players and families and look forward to meeting you all.